Finally a drone helicopter that is as simple to fly, while offering more reliability, flight time and payload capacity than any Quad or Multicopter in the same class today. Drone helicopters are able to fly under various weather conditions and tolerate high wind turbulences unlike the multicopters that can only fly in mild weather conditions. As a result of the above a drone helicopter is capable to safely and accurately follow the flight plan even under windy weather conditions. Drone helicopters are capable of carrying heavier payloads and stay in the air for long flying times unlike multirotor drones that can carry light payloads with reduced flight times. This capability combined with fast cruising speeds and hovering ability makes the drone helicopter a one-way option for execution of demanding missions such as Search and Rescue. In contrast with multirotor drones, helicopter drones are able to cover long distances quickly, accurately, consuming minimum energy with full payload even in windy weather conditions. 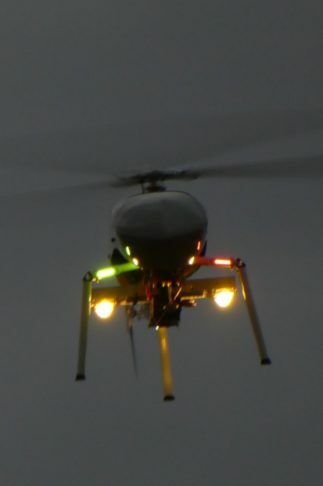 The helicopter drone is able to vary the pitch of the rotor on demand thus the ascending and descending movements can be achieved in equal time unlike the multirotor drones that the descending movement is by far slower than ascending. The actual useful flight time of a drone is less than the advertised due to the restricted max forward speed and to the slow descending that consumes useful flight time. Helicopter drones can do more accurate and efficient flight routes than airplane drones even if flight routes include square, triangle or any polygonal paths. This results a fast and accurate mission implementation with the minimum energy consumption. Drone helicopter does not require large space/airfield for take off or landing unlike airplane drones that require runway or extra equipment for taking off and a suitable large area for landing. This capability makes the drone helicopter ideal for taking off or landing on any type of ground terrain or from a mobile platform like a boat. When considering a versatile UAV solution, easy in transportation and storage you will come to the following conclusion: Helicopters UAVs require less space for transportation or storage than the corresponding multicopters or airplane drones. Furthermore the deployment process of a helicopter drone is so easy and fast, instead of assembling wings or propellers all you have to do is to mount the main blades and the helicopter UAV is ready for the next mission. WHY YOU SHOULD CHOOSE VELOS UAV? Velos UAV offers very high levels of stability. Helicopters are by nature more stable than any quad or multirotor platform. The custom designed variable geometry blades, together with the full body fuselage, further increase the performance of the ship making it not only very stable in strong winds, but also capable of very high cruising speeds. Big multicopters lack both of the above. Performing flight times of more than one hour with payload, Velos UAV is able to accomplish the most demanding missions. 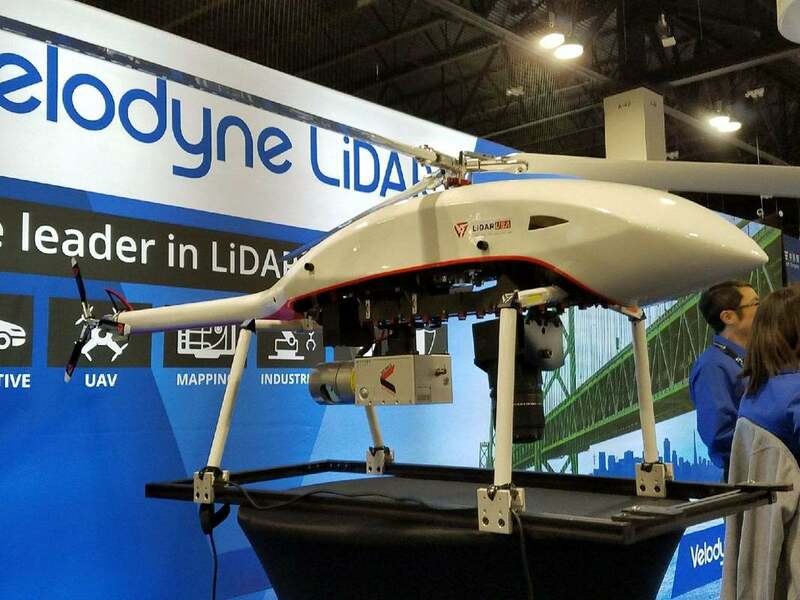 For example, being able to fly with a lidar sensor for double the time than a same class multicopter enables the pilot to better perform on a demanding mapping mission, save time, reduce operating cost and increase the quality of the work. Also, long flight times can be crucial in a search and rescue missions where you can not afford to lose time going forth and back for replacing batteries. Velos UAV is one of the safest UAV helicopters ever made. Equipped with a robust, low maintenance, competition grade drive train taken from the Velos 880, a competition 3D machine. Fully redundant thanks to twin motors, ESCs, drive belts, pulleys, bearings and four servo swash plate, it is almost impossible to lose power on main or tail rotor or lose control due to a component failure. Other UAV helicopters, that are using one independent motor to power the tail and second one to power the main rotor, are more vulnerable and the chances of crashing are doubled, as any of the motors or ESCs malfunction will lead to a crash. Velos UAV is especially suited for mission-critical missions where payload and flight duration is highly important. Velos UAV fully redundant drivetrain and ability to fly longer than any competitive product in its class make it the ideal platform for the following applications. Velos UAV equiped with Lidar sensors is able to create a very high-resolution digital surface 3D model which represents ground surfaces such as rivers, paths, construction sites, electrical networks, forestry, etc. This possibility of drone remote sensing creates huge advantages: The elimination of any danger that crews of a manned aircraft may be subjected to in difficult terrain or remote areas. The reduction of the running costs compared to similar missions with a manned aircraft and also the simplicity of the operation. 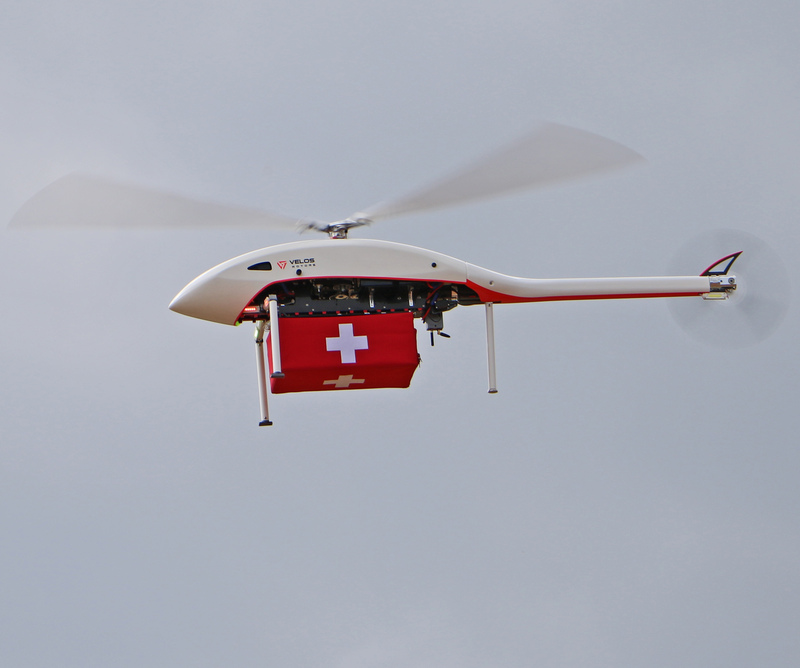 Velos UAV is a powerful tool in search and rescue missions and specifically under harsh conditions. 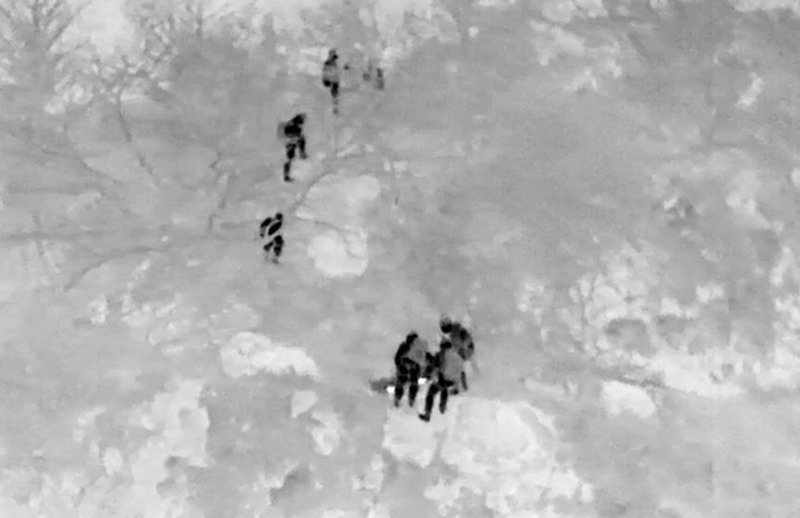 Using thermal sensors, Velos UAV can quickly discover the location of missing persons or victims at night or in challenging terrains and also provide the people supplies if the location is otherwise unreachable. 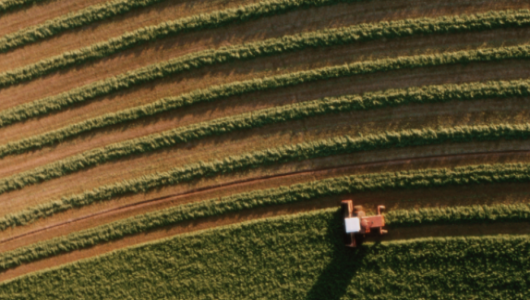 Velos UAV gives the ability to agriculture industry to gather all the information needed to be used for applications like Planting, Crop Monitoring, Health Assessment, Soil & Field Analysis etc. This is accomplished by the use of sensors and instruments such as Spectroscopes and High-definition Cameras in conjunction with on board GPS positioning information. Repeated missions and logging of the gathered information will help increase the product outcome and improve the management of the estates. Velos UAV can be used for wind turbine inspection, power line inspection, complex structure inspection, oil & gas pipeline inspection, train station inspection, railway inspection etc and provide real-time information for further analysis. This capability is accomplished by using a high-definition camera combined with a 50x or more optical zoom lense and with optional thermal cameras and other dedicated instruments the capabilities are endless. Velos UAV unlocks the full potential of delivery services, with its custom designed flat payload area that can be easily loaded/unloaded and deliver fast at any hard to reach destinations packages, letters, medicines, first aid kits and other essentials. Furthermore and most important, Velos UAV is able to accomplish safely, missions over populated areas, due to its fully redundant design and the highly reliable air frame. Using Velos UAV equipped properly may reduce the time spent collecting accurate data with sharp resolutions and gather millions of data points in one flight. The outcome of the above is that surveing teams do not risk their lives during operation in sites such as mines, transport routes, slopes etc. Furthermore Velos UAV can be used in patrol missions and provide real-time images or videos from large areas, such as shopping malls, supermarkets with large parking lots, coastlines, prisons, military bases etc to a security centre for further analysis. Velos UAV’s flexible load capability enables filmmakers to add aerial shots that were not possible before. Velos UAV offers excellent flight characteristics, long flight duration (>60 min) and minimizes the cost of filming, by replacing the very expensive helicopter pilots. Furthermore Velos UAV, as an electric powered helicopter, eliminates any vibration and the dirt on camera’s body and lense which is inevitable if the helicopter is gas powered.